Geothermal systems use the natural properties of the earth to provide heating and cooling to buildings. There are three general types of geothermal systems which are geothermal power plants, direct use geothermal hot water systems and shallow ground energy systems. This page will focus on the later. You can read more on the other types by following the links. Approximately 46% of the sun’s energy is absorbed by the earth. The remaining 54% is either reflected back into space or absorbed by the earth’s atmosphere. At a depth of approximately 4-6 metres the ground temperature remains a fairly constant temperature of between 10 and 16°C year-round, depending on the local climate, terrain and soil type. A shallow ground geothermal heating system harnesses the energy transfer of this natural occurence via many metres of high-density polyethylene pipe buried below the earths suface. This pipe is known as a loop. Fluid is circulated through the loop and into geothermal heat pumps. The size of the loop is dependent upon the cooling and heating load for the building, the type of loop installed (see Geothermal System Types) in addition to the local climate, terrain and soil type. Computer design software is best used to determine the loop size. The geothermal heat pump then amplifies and directs conditioned air into the building based upon its cooling or heating requirements. 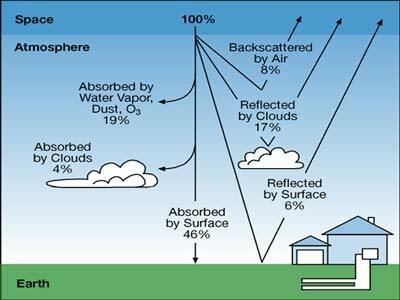 In the cooling mode, the earth acts as a heat sink enabling the circulating fluid to transfer the excess heat, absorbed by the unit, from the building zones to the earth where it is absorbed and stored for future heating requirements. The earth has a built in time delay. During those times of the year when the cooling requirements are highest, the Earth’s temperature is still relatively cool, allowing easy absorption of excess heat into the ground. The ground temperature actually lags the outside temperature by several months, so that by the time its temperature has increased, the building’s total cooling requirement has been reduced. In the heating mode the Earth acts as a heat source, allowing the circulating fluid to extract natural heat from the Earth and transfer it to the space where it can be used for heating. During those times of the year when the heating requirements are highest, the earth’s temperature is still relatively warm which makes heat extraction from the ground easy. In the heating mode, the unit function is reversed from that of the cooling mode. The geothermal unit absorbs heat from the ground and transfers it to the building zones that require heat. The ground temperature again lags the outside temperature so that by the time its temperature has decreased, the building’s total heating requirement has diminished. For most of a year the building requires both cooling and heating, allowing the water temperature in the ground loop to remain relatively constant throughout the day. This is known as a balanced system. Geothermal systems can also provide supplementary hot water to the building’s hot water system at no penalty to the units. A desuperheater is essentially a water to refrigerant heat exchanger placed either inside or outside the geothermal unit and tied into the unit’s refrigeration circuit. During cooling operation, the desuperheater takes the heat that is extracted from the return air and rejects it into the building’s hot water system before it reaches the ground loop. The benefit of these geothermal systems are twofold. First, "free" hot water is being provided to the building’s hot water system. Second, by rejecting some of the heat to the hot water system, less heat is rejected to the earth, making the loop more efficient. During heating operation, hot water is generated at the expense of space heating, but is often cheaper than heating water with fossil fuels such as gas or electricity.